Sadly an LM(E) named William Goodwin of Bellona was injured and subsequently died while playing rugby in Plymouth on 12 March, 1956. Does anyone remember what team Bellona was playing and what sort of funeral did William have? This is a long shot but someone out their may remember. The long shot paid off and we now have a number of photos of the funeral. Click HERE to view. William Goodwin was born in Shannon, New Zealand on 23 December 1930 and he married Betty and they were living at 48 Ponsonby Road, Ponsonby, Auckland. William and Betty had only been married a year marrying in 1955 and Betty was pregnant with William’s son when he died. The child when born was also named William. 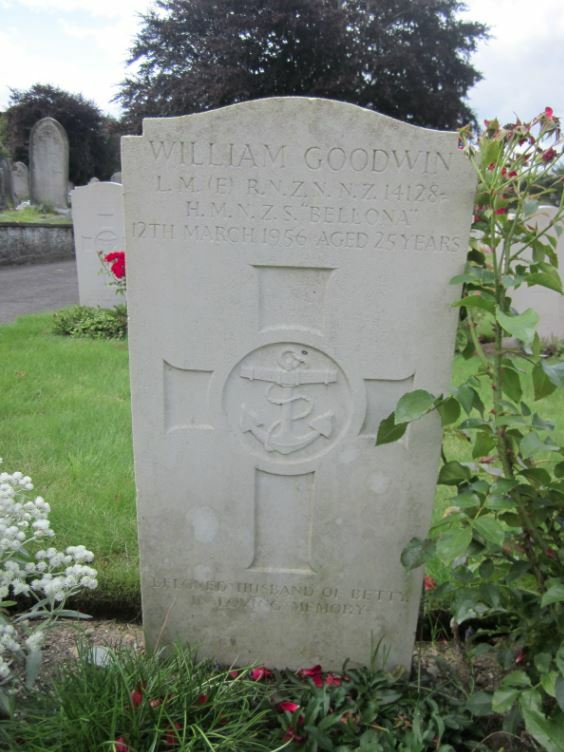 William whose service number was NZ14128 joined the RNZN as a Stoker on 24 Janaury 1952 at the age of 22. He signed on for a period of 8 years. When he died in 1956 he was taken to the Royal Navy Hospital Stonehouse and cause of death was recorded as cardiac arrest. He is buried in Weston Hill Cemetery, Plymouth. The hospital where William was taken was the Royal Navy Hospital Stonehouse which was built in 1758–65 to a design by Alexander Rowehead. The hospital housed 1,200 patients in sixty wards, its ten ward blocks being arranged around a courtyard with a central block containing the chapel, dispensary and staff housing. The design was influential in its time, its pattern of detached wards (arranged so as to minimise spread of infection) foreshadows the ‘pavilion’ style of hospital building which was popularised by Florence Nightingale a century later. Patients were landed directly from Stonehouse Creek (now playing fields). 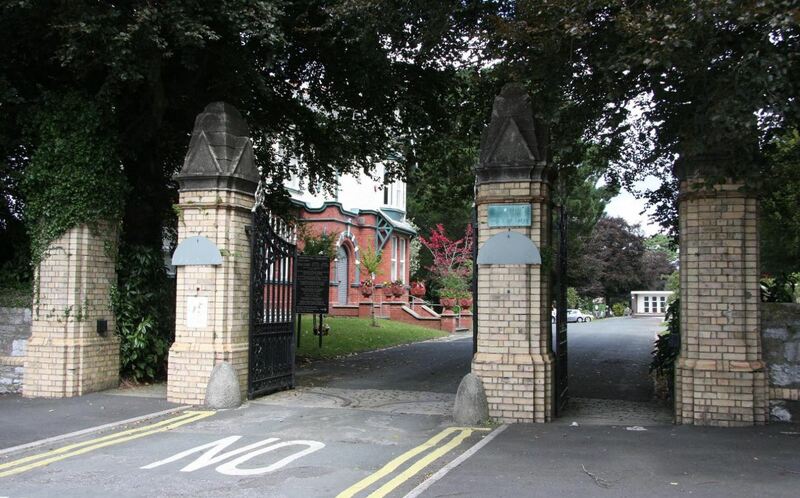 The hospital closed in 1995 and is now a gated residential complex called Millfields. Remember the occasion. Have some photos of the funeral procession. Do not remember reason for death. If I remember rightly, it was an RN team – which one I do not know. I have 10 photos of LM(E) Goodwin’s full military funeral. I know that it has left a lasting impression in my memory that I will never forget (I was 17 yrs old at the time). I have scanned the photos and will forward them to Frank. Further to my last, I was to be the bugler for the funeral, but I had not been playing for a little while and needed too much practice to be able to do the job. I was most disappointed that I could not do it. As a former Royal Marine, I was stationed at RM Barracks (RMB) Stonehouse, Durnford Street, Devonport, Plymouth, England. At the end of Durnford Street adjacent to Devonport Bridge and Union Street is the Devonport Services Rugby Football Club (RFC) or ‘Rectory Fields’. These playing fields were formerly the ‘United Services Devonport’ and sporting records go back as far as 1904. Search ‘Devonport Services R.F.C.’ on Wikipedia for contact information, they may have information in their sporting archives as to this incident and the information you seek. Additionally, you may also want to contact the ‘Plymouth Herald’ newspaper or Devonport Dock Yard and the office of the Royal Navy newspaper ‘Navy News’ at http://www.navynews.co.uk who may have covered the event. My father John (Scouse) Ernest Nolan was a member of the HMNZA BELLONA crew, a L/Sig on board 29 Aug 1950-27 Dec 1951 and again 01 Feb 1954-25 Mar 1954 as Acting Yeoman of Signals. I would be grateful to hear from anyone who served with or knew my father. We were playing a trial game between all of Bellona/Royalist players in Plymouth, England to pick the A team when Bill was accidentally and tragically kicked in the head, taken to hospital where he died. As a half back Bill was right up there. My Dad played on that team. He served in the New Zealand Navy and we as children would visit Plymouth and put flowers on his grave and my dad would do a Maori haka. My father returned to New Zealand in 1976 and has now past away. I returned to England in 1981 but never knew the grave site details I wish did. My fathers name Terrance Neville Cosgrave.